It's almost here! The J.Crew Bridal Salon! 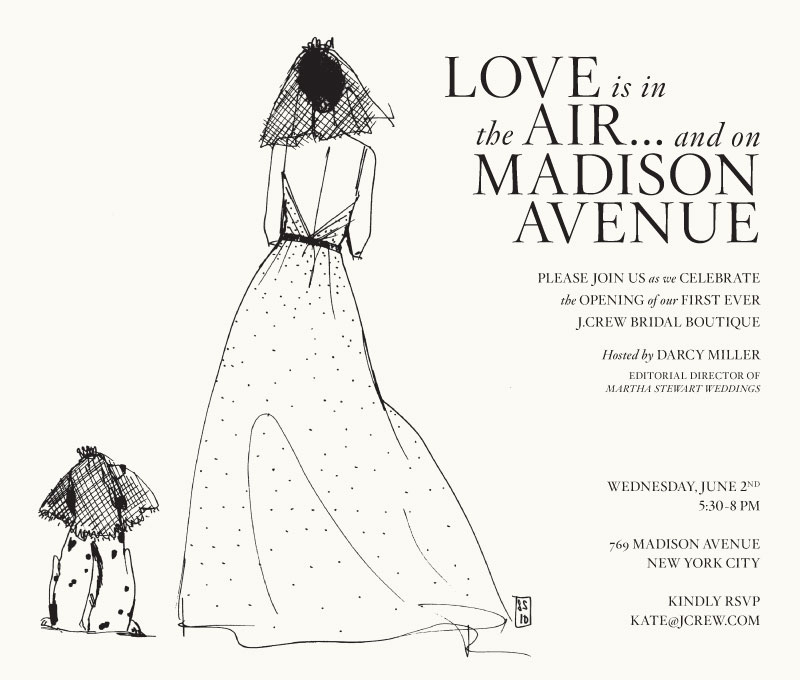 Come Wednesday June 2, Madison Avenue will play home to the first ever J.Crew Bridal Salon. Elegantly crafted with herringbone floors, custom plaster moldings, ebony wood and more, this simple and elegant salon features a carefully edited assortment of J.Crew pieces on the first floor and an appointment only bridal salon on the second. One on one appointments with our specialists ~ We will be your one stop, go-to specialist handle all details of your wedding and bridal party so you don’t have to—keep track of their measurements, details, who has ordered their dress, etc. We’ll Find It For You – No matter what the item is, if we don’t have it available at the J.Crew Bridal Boutique, J.Crew will try to find it for you. From every retail store, to our extensive online shop, to across the globe, it will be yours - Just ask us, and we’ll find it. Special Wedding packet for brides ~ giving insight into everything J.Crew wedding, what we can do, what we offer, a special little takeaway. The 4-1-1 – Offering our recommendations for NYC brides to find cakes, flowers, wedding planners, etc. We also include a list of everything that the bride will need on her wedding day –seamless undergarments, lingerie, spanx, vintage jewelry, veils, perfume and more. We truly are a one-stop-shop for every bride. And did I mention that Darcy Miller - yes the Darcy Miller - will be the lovely hostess of this extraordinary event? To RSVP send an email to Kate@jcrew.com. I'm thinking of taking a trip to NYC just to see this! I have always LOVED J. Crew's wedding line... incredibly simple dresses, to die for shoes, and awesome accessories. I've been lusting after the Lucinda gown, myself, for quite some time... not sure I'll be able to come up with the $2500 it takes to buy it, though! Thanks for hiliting their line and their boutique, I'd LOVE to go visit it too!